Employee Awards Universal Awards, located in Bergen County, New Jersey is the supplier of quality, reasonably-priced trophies, plaques, engraving, embroidery, sports apparel and promotional items that reflect your fine taste. We also make custom executive achievement and recognition awards as well as athletic awards. 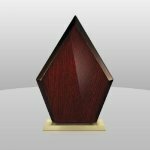 Given as a promotional item, gift or incentive award, this beautiful leatherette coaster set is sure to be appreciated. Leatherette has the look and feel of leather at a much lower cost, and the durability can’t be beat. Just 1/8” thick, the inner foam absorbs moisture, allowing the surface to retain its original beauty. Personalize them with your company logo, a monogram or other graphics to commemorate a special event. The set includes 6 square coasters in a matching leatherette holder. Given as a promotional item, gift or incentive award, this beautiful leatherette coaster set is sure to be appreciated. Leatherette has the look and feel of leather at a much lower cost, and the durability can’t be beat. Just 1/8” thick, the inner foam absorbs moisture, allowing the surface to retain its original beauty. Personalize them with your company logo, a monogram or other graphics to commemorate a special event. The set includes 6 round coasters in a matching leatherette holder. This piano finished rosewood arrow shaped award is part of our Classic Collection. 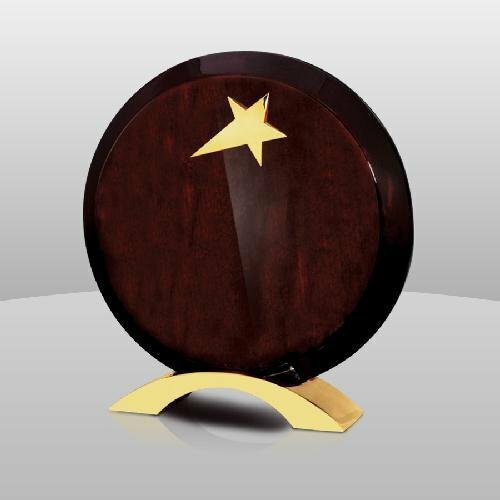 It features a brushed gold metal base and is available in three sizes. 8" x 5" x 2"
8-3/4" x 6" x 2"
9-1/2" x 6-1/2" x 2"
This item is part of the Constellation Series and the Classic Collection. 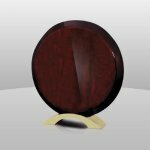 This item features a circular piano finished rosewood item attached to an arching brushed gold base. 6-3/4" x 6-1/8" x 1-3/4"
7-1/4" x 6-3/4" x 1-3/4"
8" x 7-1/2" x 1-3/4"
This item is part of the Constellation Series and the Classic Collection. This item features a gold metal star on a circular piano finished rosewood item attached to an arching brushed gold base. 7-1/4" x 3-3/4" x 1-3/4"
This clock is finished in glossy hardwood with quartz movement and a metal base supported by four solid feet. This item is part of our Clocks & Gifts Section. Gold or silver plates are available upon request and at additional cost. 5" x 4" x 1-1/2"
6-1/2" x 5" x 2"
7-3/4" x 4" x 1-1/2"
Phone: 201-327-6544 Powered by BizWizard ShopKart by NetSoft Studio, LLC.